This study aims to provide a review of the randomized controlled studies evaluating the effects of shared decision-making (SDM) intervention in comparison to care as usual in patients with mood disorders. Of the 14 randomized controlled studies identified, only three 6-month studies evaluated the interest of SDM interventions using decision aids in depressed patients. All of them showed that the intervention effectively improved patient satisfaction and engagement in the decision-making process. Only one study in patients with bipolar disorder (BD) showed improvement of depressive symptoms, functioning, and quality of life. 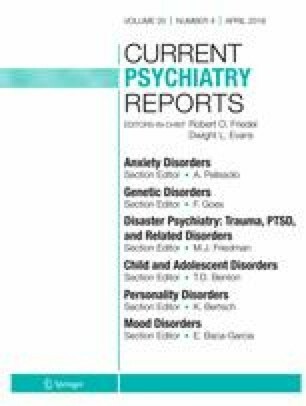 Other included studies were collaborative care interventions using a SDM approach in patients with depression in specific populations depending on age, gender, income, and physical comorbidities. All of them showed significant improvement in depression outcomes or medication adherence. SDM interventions using decision aids and collaborative care showed evidence of improvements in the management of depression. Stronger evidence of SDM interest in BD is needed. Jean-Baptiste Genty, Laurent Boyer, Jorge Lopez-Castroman, and Mocrane Abbar declare no conflict of interest. Ludovic Samalin has received grants, honoraria, or consulting fees from AstraZeneca, Bristol-Myers Squibb, Janssen-Cilag, Lundbeck, Otsuka, Sanofi-Aventis, and Takeda. Pierre-Michel Llorca has received grants, honoraria, or consulting fees from AstraZeneca, Bristol-Myers Squibb, Janssen-Cilag, Lundbeck, and Otsuka.